Make a splash with our high-quality poly plastic ice bags, printed with your logo, and address information. We have many capacities and bag styles to accommodate any need. Personalize our stock design or allow us to custom design a unique customized bag just for you. Most State Health departments along with the FDA are now requiring proper labeling of any bagged ice sold to the public. According to the FDA website about Ice Labeling: "Packaged ice labels must meet FDA food labeling requirements. The labels must list the name and place of business of the manufacturer, packer, or distributor of the ice. Also see our new Ice Bagger. Package your own bags of ice to sell or convience. The FDA and most State Health departments now require proper labeling of packaged ice. Are you complying with your State and FDA regulations? Packaged Ice must comply with FDA ingredient requirements any statements made on the bag and in the marketing of the product must be accurate. That specific information (Statement of Identity, Net Weight, and the Manufacturer, Packer, and Distributor Information) appears in precise locations on the package. That the required information is readily viewable to a purchaser when the package is stacked in a retail freezer and that the required information is presented in specific ways. The Statement of Identity may be expanded to use a food name that accurately describes the food by nature of ingredient process or ingredient addition. Important: Doing so requires that the name of the ice cannot be misleading and the process by which it was purified must meet Code definitions and be explained directly next to the Name of the Food in a “Made with...” statement. The Statement of Identity also addresses the section of the law and FDA policy that indicates that the consumer must be able make accurate product comparisons and selection decisions. The statement must show the net contents in both U.S. Customary System terms (pounds and ounces) and metric (grams, kilograms) terms. Metric weight can be placed first or last. Net means net: exclude the weight of all packaging in determining net weight. Our custom drawstring ice bags are a popular choice for hospitality, retail, convenience stores, special events and promotions. A single cotton drawstring makes closing, handling, and transporting ice cubes easy while keeping hands warm and dry while keeping the ice cold. Custom printed open top ice bags are made from folded polyethylene sheeting, are sealed at each side, and are available with or without a bottom gusset and with or without lip. 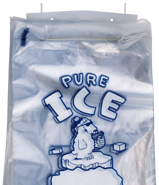 These custom ice cube bags are commonly used for retail ice sales. Custom wicketed ice bags are packaged on a "U" shaped wire, generally in groupings of 100 to 250 bags. Originally designed for use with automated ice cube packaging machines, wicketed bag are easy to use and efficient in Semi-Automatic Packaging Machines. Custom ice bags on wickets feature a side weld with two holes in the lip on a metal wicket.